Recently accomplished: fancy balustrades for PROMENADA III Warsaw shopping centre. Our powder coating line is equiped with the bake oven covering 7200mm x 500mm x 1500mm of work space. We manufacture and assembly the wide range of ironworks for multipurpose. 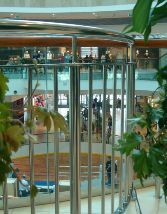 Our ironworks decorate many modern shopping centres, company buildings, houses and the like. Copyright © 2005 Sławmont. Designed by: www.adm-media.pl.